Hello all! as you can tell by the title, this is a little haul showing you what I got in London and a couple other things I’ve picked up recently. It isn’t a lot because money is tight at the moment, but I promised I’d show you! Before I start, I thought I’d let you know that the BLOG SHOP has been updated with lots of lovely things including lace up wedge boots, dresses, shorts, vintage pieces and make up, so be sure to take a look and let me know if you want anything via the comments form, Twitter or my email address in the sidebar! Click HERE to go shopping! Now… onto the good stuff! First of all is the skirt you will have seen in the last post, but its so lovely I thought it deserved to be shown again! 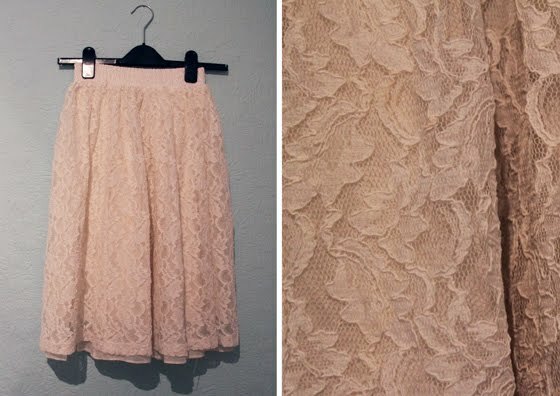 I spotted this lace midi skirt hidden away in Absolute Vintage. It £18.00 which I probably wouldn’t have normally spend on vintage, but I think its worth the money and I’ll be able to wear it all year round. Next up are two scarves I picked up in Beyond Retro for £3.00 each. I love the designs on these and they are great to add a splash of colour to any outfit. I love scarves like this as they’re really versatile. I use them round my neck, tied in my hair or attached to my bags. This little guy isn’t technically mine, but I had to hang him on my wall as he is too darn cute not too! Dan got this little knitted octopus from an amazing vintage style interior shop called Caravan. He cost £5.00, and they also make other animals like this too! This is a collection of magazines I’ve bought over the past week. If you know Preston, then you’ll know that since Borders shut down, fashion and design magazines like these are few and far between, so I struggle to find them a lot of the time. Whilst I was in London I picked up Love. I wished I had got a few more magazines as there were so many to choose from, but I didn’t have time to browse sadly! We stopped off at a service station on the way home where I bought Elle Decoration and Creative Review, and then whilst out and about in town on Friday I got Wonderland and my new favourite, Oh Comely! Finally, yesterday I went to a lovely little gift shop not too far from where I live with my sister. I found this blue bunting for just £4.99 and couldn’t resist. As you can see, it goes perfectly with my polka dot wallpaper! So that’s all for today. I’ll be back tomorrow to spread a little love for Valentine’s Day! Until then, don’t forget to check out the BLOG SHOP! "DECKED IN LACE AND LEATHER"
I love the bunting, it's adorable – and the scarves are gorgeous. 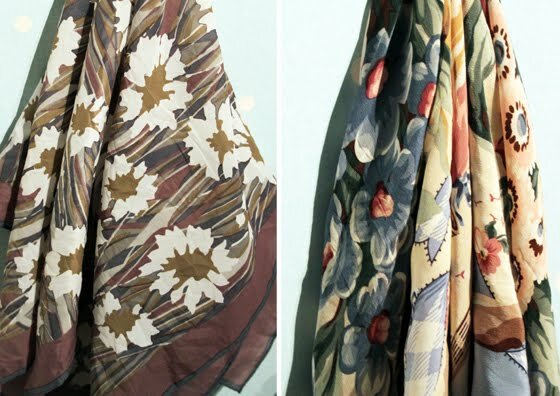 I have a thing about vintage scarves, they're so perfect! Good haul, it sounds like you had a great time in London!